Once upon a time, the Arthurian parallels found in Destiny were subtle: world-building elements such as setting forth on quests while mounted atop our steeds (Sparrows), or the Questing Beast auto rifle (an allusion to T.H. White’s Once and Future King), or the “Chanson de Geste” shader (literally a “song of deeds;” a list of a knight’s successes), or even that Oryx’s dreadnought had its roots in medieval cathedral architecture. If you’re interested in some in-depth notes on these links, you can read about them here. In Rise of Iron, Bungie went out of their way to make those references explicit. They’ve been referring to Guardians as “knights” for a while, and now that we’ve had the chance to learn about the round table that was the Iron Lords, all of that idle, Arthurian imagery has been pushed front and center. Radegast was “The King Arthur of the group,” who asked his fellows to join him as “Knights of old.” Skorri busied herself writing battle-poetry about her own companions. Jolder, described as the group’s Lancelot, leapt into single combat, carrying a shield and wearing a cuirass. The new Iron Banner armor and weaponry is even more medieval (and awesome) than in years One and Two. I mean, who puts fur on a gun? The Iron Lords, I guess. And behind it all, we absorbed the story of a group of men and women and space robots devoted to creating something good out of a world left in ruin; whose endless, noble final stands became the stuff of Guardian legend. It’s all – well, mood-wise, it’s wonderful – and wonderfully medieval. Destiny’s call has always been to “become legend,” and although The Taken King was far and away a more successful exercise in storytelling, Rise of Iron is determined to make us feel as though we’ve finally achieved that stated goal. Even if you’ve already noted these allusions, there are a few more nods to Arthurian myth you may have missed. The references in Rise of Iron are many, but it’s the little touches that go the furthest in fleshing out the game’s universe. We already had Chanson de Geste, but Rise of Iron gives us two more Arthurian-themed shaders to enjoy. “Knight-Errant” is the first. This one is a bit self-explanatory: a knight-errant is a romantic character (as in, medieval romance – meaning stories of chivalric deeds) who’s out in the world searching for adventures with which to make their name – much like we are. The second is “Perilous Quest,” which is a bit more obscure. This is a reference to the Siege Perilous (literally, “Perilous Chair”), the seat at the Round Table reserved for the knight who would succeed in their quest for the Holy Grail, as related in various pieces of Grail-Cycle literature. For anyone else to sit upon it was death. 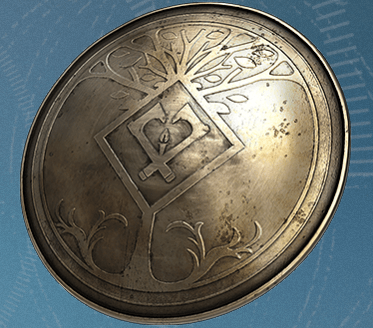 This myth has some very old roots, but in-game it’s a nod to the guardian who is…destined…to succeed in their (very perilous) literal quest to destroy SIVA (itself a grail for the Fallen Splicers and the original Iron Lords), as well as in the metaphorical quest to become legend by achieving victory in the Iron Banner. This new emblem, The New Wolf Pack, is not the first heraldic emblem we’ve seen in Destiny. In fact, many of the in-game emblems take cues from heraldic imagery. But The New Wolf Pack is explicitly based in this tradition, and it’s a fine example. Technically, the wolf featured on the shield would be described as “Un loup statant contourné,” or simply “A wolf standing still and facing to the right.” In medieval heraldry, wolves didn’t represent one fixed ideal. Courage, ferocity, and perseverance were all features of the heraldic wolf. But interestingly, wolves were generally seen as man-eaters and scary predators – which puts an interesting spin on the way Guardians might be seen by the rest of humanity. Beneath the wolf, two crossed axes represent both the signature relic of the expansion as well as military duty. Anvils commonly denote both honor and the smithing profession; in this case my guess is that it’s the former – although you’ve re-forged a couple of weapons, haven’t you? The Gjallarhorn isn’t quite Excalibur, but it’s close – and young Arthur drew that exact sword from an anvil in at least one retelling. 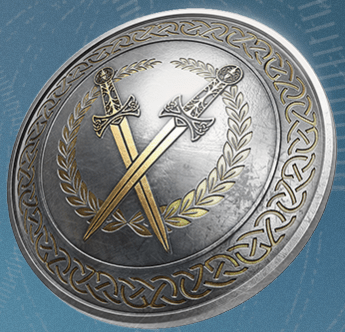 Regardless, honor and duty are a big deal for Saladin and all the Iron Lords, and it’s a pretty cool emblem with some depth to it. You need a new tattoo, right? You may have already decided that the Iron Temple atop Felwinter Peak looks pretty darn epic. You wouldn’t be the first – it’s very much modeled after actual medieval tombs and friezes, particularly those representing the Nine Worthies – a group of medieval heroes that demonstrated the best of battlefield – and moral – prowess. We even imitate the pose shown in these carvings (and in the Iron Tomb) when Saladin gives us the Young Wolf’s Howl, which is a great way of visually representing our ascension to Iron Lord-hood with some very time-tested imagery. That said, it’s also a bit morbid – I think the most pessimistic among us could rightly suggest that it feels a bit like foreshadowing our own interment in the Iron Tomb. Perhaps, as Lord Saladin notes in Grimoire: Mysteries 3, nothing lasts for ever – and we, like the original Iron Lords, are doomed to fade away. Helmet in one hand and torch in the other, Saladin Forge marches through the snow. He can sense the wolves emerge around him; only three of them come into view, but this group has followed him on his patrols since the Devils raided the Plaguelands. He has given up dissuading them. They’re defending their territory, and Saladin can relate to that. But they will not last long. Nothing does. Not the Golden Age. Not the colony ships. Not the impenetrable walls of the Cosmodrome. He discards his torch, and glances up to see a familiar glow reaching out from the dark. He smirks. A horde of Devil Splicers returns his stare from the wreckage of the wall ahead. The Splicers are doomed. Just as the Iron Lords were, when he and his allies opened that vault. As Fallen continue to pour through the gap in the wall, they remind him of his friends in their final moment: a crimson pulse beats in place of their hearts. SIVA. He puts his helmet on as an Iron battle axe forms in his hand, the air around him bursting into flame. The first wave of dregs approaches. Saladin breaks into a charge, swinging the axe to bear as he smashes into a storm of steel and weapons fire. As his axe bites, again and again, Skorri’s Iron Song haunts him. He calls upon Radegast’s strength. Perun’s sense of purpose. Timur’s questions. Felwinter’s cynicism. Silimar’s persistence. Gheleon’s reasoning. He pounds the last Splicer priest like a burning hammer, blasting a crater into the snow and gravel. Frozen dirt rains down on the spent shells and the mounds of Splicer corpses that surround him. The Warlocks of the City have described meditation to him. He imagines it feels like this. He always survives. When nothing else does. “Lord Saladin? What’s your status?” calls Shiro-4 through his audio feed. “Just— Taking a walk,” he says, staring at the fifteen-foot divide he broke in the earth. He had to meet SIVA again. One last time. Timur always said that Clovis Bray was the key. How different would things be, had Saladin listened? Would his friends still live? Would he? He sees the wolves have formed up around him. Eight of them. This reference is thematic, rather than explicit. There are a host of stories and legends, both medieval and modern, about King Arthur’s prophesied return. The most famous of these appeared in Sir Thomas Malory’s Le Morte D’Arthur, as the tomb-inscription “Hic iacet Arthurus, rex quondam, rexque futurus”: Here lies Arthur, King once, King to be. Although we may not share the name of any of the fallen Iron Lords, we share their nobility and valor. And, in taking up their mantle, we fulfill the unspoken and unexpected prophecy of their return. Of course, it’s all well and good to reel off parallels, but it’s more interesting to talk about what they mean, and how they relate to the storytelling in Rise of Iron. Bungie has told us this expansion was designed to be all about nostalgia, and it’s no secret that ROI is partly stopgap content: the necessity of new experiences to hold players over until a delayed Destiny 2 release meant that another expansion was crucial to holding players’ interest. In that spirit, Bungie made a host of gestures to the Guardians who have been around for a while: the Gjallarhorn is back. Thorn is back. The Khvostov is back, the discovery of which is accompanied by a heartfelt speech from Ghost to player that sounds a bit more like Bungie thanking us for sticking around. Drawing on myth is a great way to encourage the player to feel that way. It’s also a great way to flesh out a world without having to invent too much by yourself. But the thing is, Rise of Iron is more an exercise in retconning narrative than it is to driving the story. Telling the tale of a group that didn’t have a background in the original game is all well and good, but it falls short of really driving the narrative along. Don’t get me wrong – there are veritable handfuls of breadcrumbs hidden in the new Grimoire cards and SIVA Clusters for Rise of Iron. But they’re just breadcrumbs. The problem I have with the expansion is that it relies too heavily on nostalgia – and too heavily on mythography – without adding enough to drive the narrative forward. Once again, Bungie has given us more questions than they have answers. That’s not an issue if, ideally in Destiny 2, some of these questions begin to be addressed. I certainly hope that turns out to be the case. And I’m sure that no matter what happens, we’ll continue to be treated to plenty of medieval tropes. Thankfully, for nerds like me, there’s still plenty of lore to sift through. If you have your own favorite Arthurian references in Destiny, share them in the comments – I’d love to hear what’s gotten you excited.